Master Replicas, best known for their Star Wars prop replicas, has been sold to Factory Entertainment. This is according to Play Things. Darren Epstein’s new Factory Entertainment has bought the Master Replicas IP and brand. 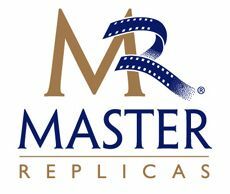 Factory Entertainment has completed a deal to take over control of the Master Replicas Brand and IP from previous owner Hong Kong-based Corgi International. In addition to the brand and IP, it will also control certain designs and tools used for products previously produced by Corgi under the Master Replicas brand name. Factory Entertainment, a new collectibles entity formed by Darren Epstein, founder of Cards Inc. will attempt to grow the Master Replicas brand with authentic, relevant prop collectibles with strong secondary market appeal. That's not really that surprising. The company died as soon as the lost their SW license. I wonder what this means for the value of their props? I haven't bought anything from them in a few years no less checked their site. I had no idea they lost their SW license. So maybe this will mean a new lease on life for them. Yeah they lost the license awhile ago. eFX ended up picking it up and have already made and distributed a lot of great products. "Factory Entertainment" conveys such a warm, personable and inviting corporate image.